Leading Edge Group specializes in business transformation programs globally for over 20 years. We established this Award in 2017 to formally recognize the efforts and progress of those organizations striving to achieve and sustain excellence across all operations and develop an ongoing culture of continuous improvement. Assessed by an adjudication panel, chaired by Leading Edge Group Board Chairman – David Skelton – the Award is based on overall operational excellence including strategy; capability; capacity and improvements that have been realized and sustained. 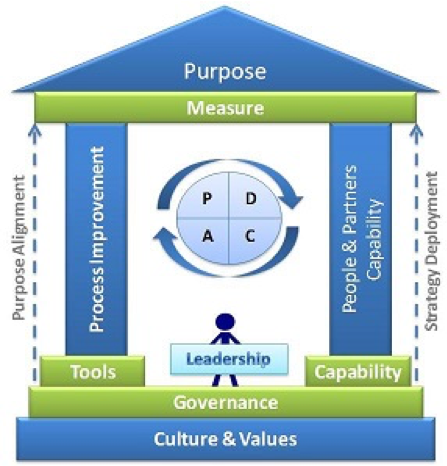 It specifically focuses on those five pillars (Governance, Capability, Make It Happen, Tools, and Measure) as defined through Leading Edge Group’s operational excellence framework. The City of Mississauga was selected as winner in 2018 thanks to the tremendous progress and commitment demonstrated over the past two years. The City has developed and deployed Lean with great effect in line with its priorities to contain costs, improve customer experience and increase the speed of business processes. Throughout the corporation the City have now amassed over $9.4m in cost savings and cost avoidance, through 2,500 trained staff. Ornua became the first European winner of our International Continuous Improvement Excellence Award for 2017. The award was presented to Ornua COO, Anthony Proctor, by Joe Aherne, CEO, Leading Edge Group at Kerrygold Park in Mitchelstown, Co. Cork. Ornua’s operational excellence team were acknowledged for successfully deploying ‘The Ornua Way’, Ornua’s operational excellence programme, across six European processing facilities in 2016 resulting in financial benefits of €2.4m. To download the Ornua Whitepaper please click here. Aquatera Utilities Inc. (Aquatera) became the first North American winner of our International Continuous Improvement Excellence Award for 2017. Aquatera was selected as winner thanks to its progress and commitment to becoming a Lean organization over the last two years. Removing ‘waste’ from a customer’s perspective is the main focus of Lean initiatives. This, along with intentional cost containment efforts by everyone at Aquatera, contributed to improving financial performance. To date, Aquatera has been able to achieve realized savings of $980,000 through Lean initiatives. To download the Aquatera Whitepaper please click here.